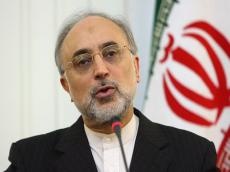 Head of the Atomic Energy Organization of Iran (AEOI) Ali Akbar Salehi says the country has broken new ground in the field of nuclear technology and is now taking preliminary steps toward production of 20-percent modern nuclear fuel, Trend reproted citing Press TV. “Preliminary steps have been taken to design modern 20-percent fuel and we are on the threshold [of producing it]. This [new] product is different from the previous 20-percent fuel and we can supply fuel to any reactor similar to the Tehran [Research] Reactor,” Salehi said. He said Iranian scientists have made such remarkable advances in the field of nuclear technology that instead of reserve engineering, they are now capable of designing new fuel, which is a major achievement for the country. AEOI’s spokesman, Behrouz Kamalvandi, told reporters last June that Iran would soon start re-building the Arak heavy water reactor once a Chinese expert team finished examining the last phase of the re-designing process. “According to the timetable, we have fortunately made good progress, and the detailed stage has been completed on our part and delivered to the Chinese side, which … will enter the next stage within 2 to 3 months; that is, we'll start the next phase of building and [installing the reactor’s] equipment,” he added.